This memo provides very basic overview of existing policy formats with the goal to identify possible option for future refactoring of the AAA Policy language. 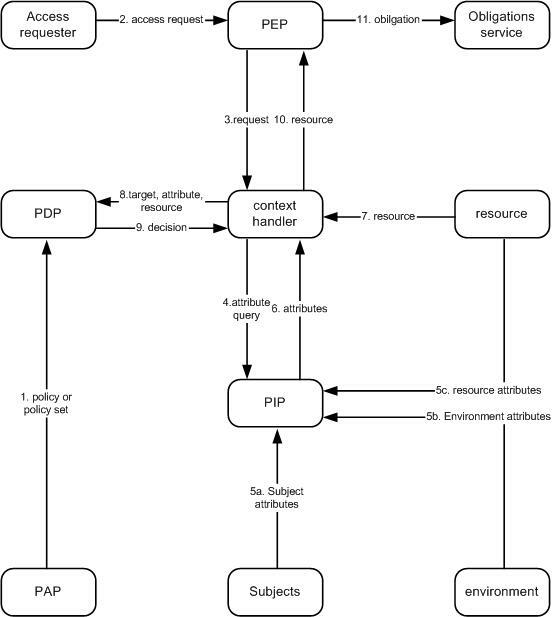 WS-Policy Framework (WSPolicy) provides a general purpose model and corresponding syntax to describe and communicate policies of a Webs service. Policy comprises of policy expressions (element PolicyExpressions) that may contain one of policy operations (“OneOrMore”, “All”, “ExactlyOne”), policy assertions (element PolicyAssertion) or policy reference (element PolicyReference). Policy operations can be nested and may contain any externally defined content. The PolicyExpressions element can be used as a container for actual application/service-type specific policies definition. WS-SecurityPolicy – defines WS-Security policy extensions to WSPolicy that include the following assertions: SecurityToken, Integrity, Confidentiality, Visibility, Security Header, MessageAge. WSPolicy set can be combined and interact with all other components of WS and WS-Security specifications. All WS-Security components are also using WS-Security extensions (WSSE) and WS-Utility (WSU). Other important WS-Security specifications such as WS-Federation, WS-Trust and WS-SecureConversation are actively using WSPolicy and other WS-Security specifications. WS-Trust that enables Web Services to request and issue security tokens and to manage trust relationships. WS-SecureConversation defines extensions for secure communication by establishing and sharing security contexts, and deriving session keys from security contexts. WS-Federation introduces well-defined mechanisms and procedures for mapping trusted information about users from one domain into authentication and authorisation information required by resource or service provider from other domain. The functionality provided by WS-Federation is similar to identity federation functionality provided by Liberty Alliance Project however it is more naturally integrated with other components of WS-Security framework. XACML (eXtensible Access Control Markup Language) defines reach policy format for access control based on “Subject-Resource-Action” triad attributes. XACML defines format for policy and request/response messages. Decision request sent in a Request message provides context for policy-based decision. The complete policy applicable to a particular decision request may be composed of a number of individual rules or policies. Few policies may be combined to form the single policy applicable to the request. XACML defines three top-level policy elements: <Rule>, <Policy> and <PolicySet>. The <Rule> element contains a Boolean expression that can be evaluated in isolation, but that is not intended to be accessed in isolation by a PDP. So, it is not intended to form the basis of an authorization decision by itself. It is intended to exist in isolation only within an XACML PAP, where it may form the basic unit of management, and be re-used in multiple policies. The <Policy> element contains a set of <Rule> elements and a specified procedure for combining the results of their evaluation. It is the basic unit of policy used by the PDP, and so it is intended to form the basis of an authorization decision. The <PolicySet> element contains a set of <Policy> or other <PolicySet> elements and a specified procedure for combining the results of their evaluation. It is the standard means for combining separate policies into a single combined policy. XAML Policies are based (or bound) to subject and resource attributes that are different from their identities. XAML allows multiple subjects and multi-valued attributes. XAML also allows policies based on resource content what means that authorisation decision may be based on content of the requested resource or its status. Information security policies operate upon attributes of subjects, the resource and the action to be performed on the resource in order to arrive at an authorization decision. In the process of arriving at the authorization decision, attributes of many different types may have to be compared or computed. XACML includes a number of built-in functions and a method of adding non-standard functions. These functions may be nested to build arbitrarily complex expressions. This is achieved with the <Apply> element. The <Apply> element has an XML attribute called FunctionId that identifies the function to be applied to the contents of the element. Each standard function is defined for specific argument data-type combinations, and its return data-type is also specified. 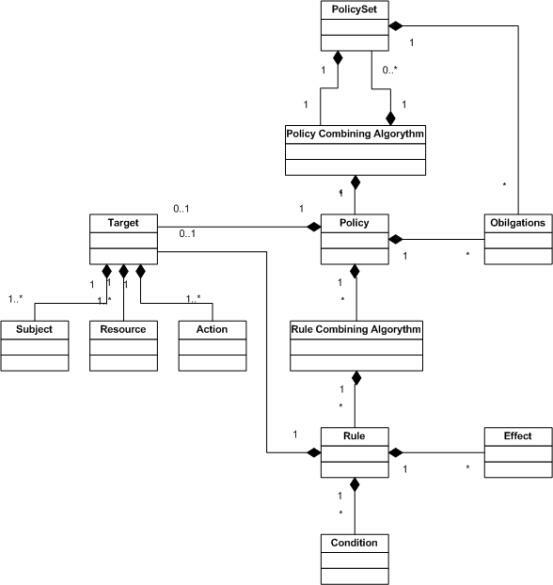 Figure 2.1 below shows data-flow for the policy-based decision making based on XACML which to large extent corresponds to the standard policy-based authorisation. The model operates by the following steps. 1. PAPs write policies and policy sets and make them available to the PDP. These policies or policy sets represent the complete policy for a specified target. 2. The access requester sends a request for access to the PEP. constructs an XACML request context in accordance with steps 4,5,6 and 7. 4. Subject, resource and environment attributes may be requested from a PIP. 5. The PIP obtains the requested attributes. 6. The PIP returns the requested attributes to the context handler. 7. Optionally, the context handler includes the resource in the context. 8. The context handler sends a decision request, including the target, to the PDP. The PDP identifies the applicable policy and retrieves the required attributes and (optionally) the resource from the context handler. The PDP evaluates the policy. 9. The PDP returns the response context (including the authorization decision) to the context handler. 10. The context handler translates the response context to the native response format of the PEP. The context handler returns the response to the PEP. 11. The PEP fulfills the obligations. 12. (Not shown) Finally, if access is permitted, then the PEP permits access to the resource; otherwise, it denies access. Figure 2.2 presents the Policy language model. Fig. 2.2. Policy language model allowing Policies and Rules combining. Figures 2.3 and 2.4 shows the structure of Policy element and Rule element. Policy is bound to the Target that is described by Subject, Resource and Action. Policy may contain a number of rules defined by multiple Rule elements. Fig. 2.3. Definition of the Policy element in XACML binding access rules to the Target (Subject, Resource, Action). A rule is the most elementary unit of policy. The main components of a rule are target, condition that are represented by subelements and effect which is included as an attribute of the Rule element. The <Condition> element is a boolean function over subject, resource, action and environment attributes or functions of attributes. If the <Condition> element evaluates to "True", then the enclosing <Rule> element is assigned its Effect value. The <Condition> element is of ApplyType complex type. The <Apply> element denotes application of a function to its arguments, thus encoding a function call. The <Apply> element can be applied to any combination of<Apply>, <AttributeValue>, <SubjectAttributeDesignator>, <ResourceAttributeDesignator>, <ActionAttributeDesignator>, <EnvironmentAttributeDesignator> and <AttributeSelector> arguments. Fig. 2.4. Definition of the Rule element in XACML defining the access Conditions to the Target (Subject, Resource, Action). XACML re-uses enumerated list of functions and operations defined in XPath 2.0 and Xquery 1.0. Complete list of functions defined for FunctionId attribute of the <Apply>/<Condition> element is provided in Appendix B. Element Target contains matching specification for the attributes of the Subject, Resource and Action. The structure of these elements are as shown on Fig. 2.5. Fig. 2.5. Definition of the Subject/SubjectMatch element in XACML. XAML defines format for the Request message that provides context for the policy-based decision. Request may contain multiple Subject elements and multiple attributes of the Subject, Resource and Action. Response message defined by XACML provides format for conveying Decision (“Deny” or “Permit”) and Status of the decision making process. Operator “IF” may contain operations PRESENT, EQ, GT, LT, LE, GE, Subordinate, Substrings, Subset, Superset, NonNullIntersection, ApproxEQ, Operator, AND, OR, NOT, which AND, OR and NOT can contain cascaded “IF” elements. Rule- and policy combining algorithms are included as mandatory algorithms in the PolicySet and Policy elements respectfully. The implementation MUST use the attributes associated with the following identifiers in the way XACML has defined. This requirement pertains primarily to implementations of a PAP (Policy Administration Point) or PEP (Policy Enforcement Point) that use XACML, since the semantics of the attributes are transparent to the PDP (Policy Decision Point). Status code is reported in the Decision/Status/StatusCode of the Response message. Implementation support for the urn:oasis:names:tc:xacml:1.0:context:status element is optional, but if the element is supported, then the following status codes must be supported and must be used in the way XACML has specified.